Dutch Gable carports provide protection for your vehicles whilst also adding the most value to your home. If you’re looking for a premium carport that actually looks the goods, it’s hard to go past our Dutch Gable carport. These carports offer full protection for your valuable whilst enhancing the appeal of your own home or property. Featuring a strongly designed frame and structure, it also includes proper flashings and trim to finish the product off properly. These Dutch Gable Carports also have a 20 degree roof pitch as standard to closely match most houses than the 15 degree pitch seen in other competitor’s carports. At 20 degrees the whole structure ‘scales’ a lot better. In other words it will look right with your house. Choosing colours to match your home is simple with the entire colorbond range available. Bluescope Lysaght have introduced several new colours to the range in the last few years to keep up with current steel trends. These days it’s getting harder to buy Australian made. 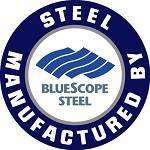 We are very proud to only use steel from Bluescope Lysaght. Our national agreement also means that we can not only supply south east QLD and northern NSW, but most other parts of Australia as well.